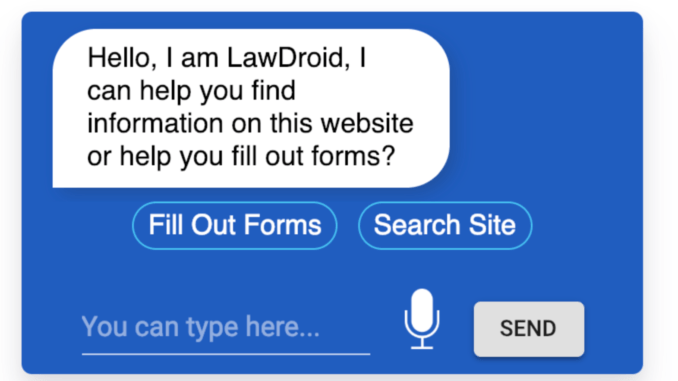 LawDroid, the legal bot developer, has now launched ATJ Bot, a voice operated legal aid assistant that initially will focus on giving help on uncontested divorces. The project has been backed by America’s main legal aid body, the Legal Services Corporation, plus West Tennessee Legal Services and the Tennessee Alliance for Legal Services, with the system operating in that State. Development began in early 2018. ATJ Bot can be used either with voice or use typed in text via a web portal. The voice system is based on the Google Duplex system and allows a user to speak and receive answers, as well as to be guided through the process of filling in the legal forms necessary to file an uncontested divorce. 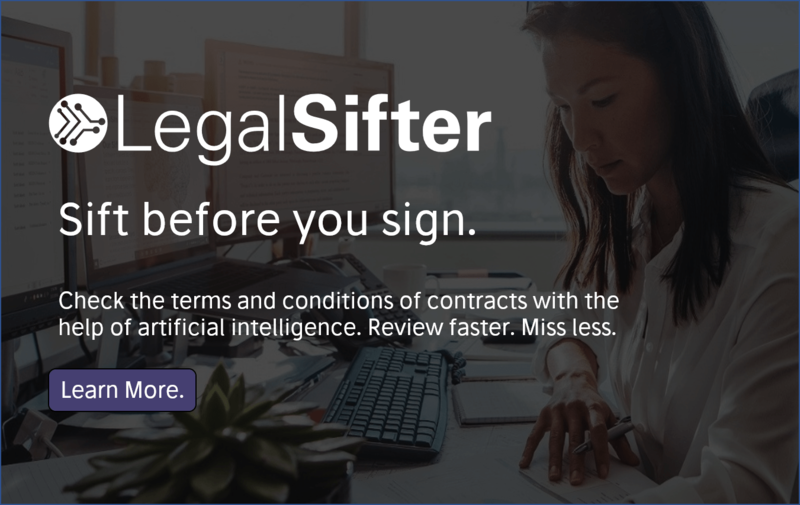 Other legal tech businesses have used voice before – and LawDroid and its founder, Tom Martin, have developed several such bots in the past. But, this appears to be the first one to be officially backed by a legal aid organisation. Once a ‘client’ has completed their forms, with the help of the bot – which speaks in a man’s voice – it’s up to the divorcing parties to print out the documents and take them to a court in person to file them. The system will allow a user to fill in part of the forms, then stop, then come back to the process later. If a user stops the process and doesn’t come back for a certain period, then all the personal data is destroyed. And, it can also help a user find around 10 different types of other documents that may be of use, such as name change forms, though for now the ATJ Bot is only helping to fill in the divorce forms. ‘The bot is capable of holding a client interview and qualifying if you are right [in terms of your situation] for what you are doing. It interviews you, and fills out the documents, and advises on how to file the documents,’ explained Martin, who is based in Canada, but works globally. The tech behind this is all based on Google’s own natural language processing (NLP) software, which Martin says has been very accurate at understanding people’s voices and picking up key words. This is because of Google’s huge and ongoing machine learning investment in NLP. If you wanted to, you could call this an AI system, though in this case the ‘AI’ part is being run from Google. 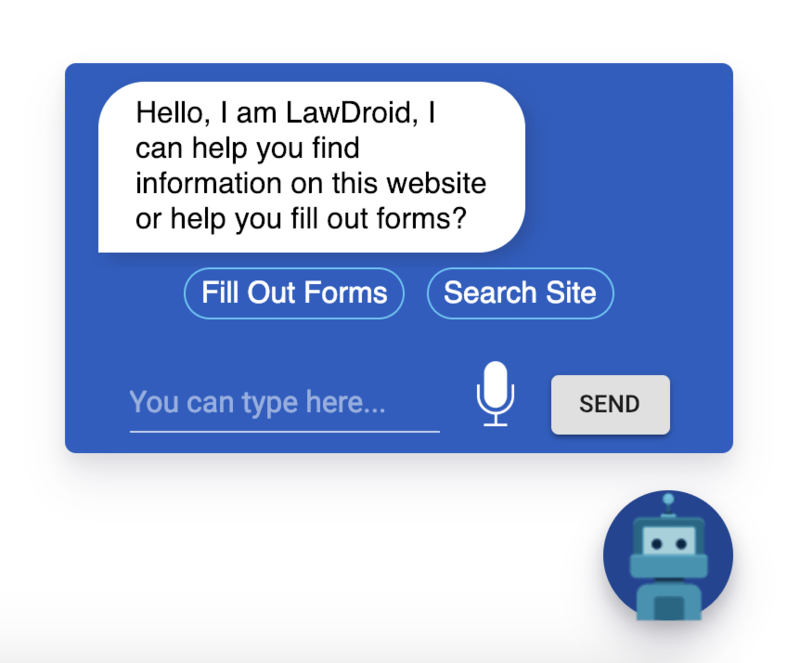 What LawDroid has done is a great bit of legal engineering and legal design, by putting together the pieces and understanding the user needs to build something that is practical and useable. ‘It’s just for divorce at the moment in Tennessee, but it is a working robot lawyer,’ stresses Martin, well aware of the highly charged connotations of that phrase. But, is this legal advice? ‘I don’t think so. If get a book from a library on how to fill out a legal form is that legal advice? It’s not that different,’ Martin says. He adds that as more people start to use the system it will be fascinating. They will be able to learn which parts of the process are hardest for a user to stay with and how they can improve the interactive service. ‘So much activity with a human lawyer is not documented,’ notes Martin, with a digital interaction like this much more can be analysed and understood about those encounters. Of course, this is not all digital. ‘They still have to go up those court steps to file, as there is no e-filing in Tennessee,’ Martin concludes. Even if it cannot do the infamous ‘last mile’, the ATJ Bot can do a lot – moreover the end user is not being charged for this legal aid support. But, will this make a difference? At this scale, i.e. one type of document set in one State in the US, its total impact will be small to begin with. However, you can imagine how much impact this could have if it were used across a wide range of documents, across a lot of jurisdictions. It could soak up a lot of day to day legal needs of a very large number of people. Legal aid bodies that are strapped for cash could put in place automated systems that take away a huge amount of ‘admin’ work, for example. Do legal aid lawyers, who work incredibly hard for relatively a lot less than some of their commercial peers, want to spend their time doing admin, e.g. walking people through blank template forms that need basic personal information added to them? Nope, of course not. 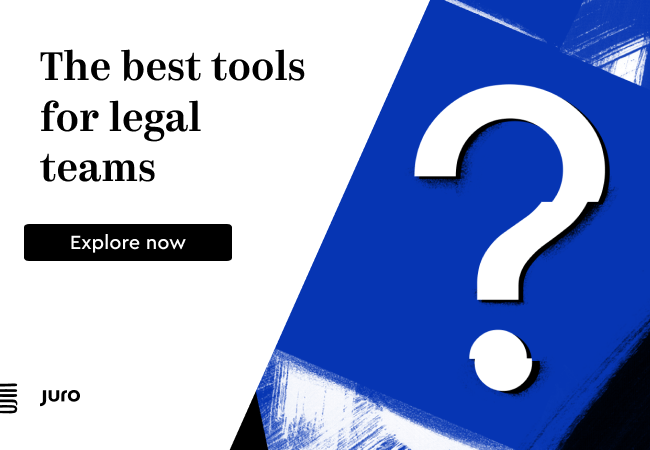 The same applies to commercial lawyers in the consumer space, who lose a huge amount of time filling in template forms for clients, often in scenarios where that admin time is not billable – something that Clio, a partner of LawDroid has analysed in detail. For example, they found that in the small firm segment in the US, ‘out of a standard eight-hour workday, lawyers record only 2.24 hours of billable work’. I.e. they are wasting five and a half hours on either form-filling admin or other unbillable activities such as chasing and sending bills. Will this bot change the world overnight? Nope. Such systemic applications rarely ever do because they involve a relatively high level of engagement for an organisation to introduce such changes. Yet, it shows what can be done and it’s also a lesson for legal aid bodies around the world. Clearly there is a notable level of initial sunk costs to get up and running, but automating that work must surely pay for itself in the medium to long term? Final question: why voice? Why is voice any better than just a text system that the user has to read and type into? Martin has spent a lot of time on this question and in fact started out on just text systems. However, he has come to the conclusion that if you have a legal issue, then interacting with the human voice is just so much better. It’s simply more….er…..well, human.